Press the Search key. This opens the App Launcher and places a cursor in the search bar. You can then scroll between your windows in the App Launcher by using two fingers to swipe up or down on the touchpad. Click the App Launcher icon. This icon is located on the bottom-left of your desktop on your Chromebook shelf. Your Chromebook comes with shortcuts for several applications already in place, this may differ slightly from Chromebook to Chromebook. If we cover an application not already existing on your Chromebook, it can be easily added through the Chrome Web Store. Whether you’re creating applications through the Google web-based OfficeSuite or you just want a place to store your important files, Google Drive is your hard drive in the cloud. Save your files to your Google Drive folder, and it will sync to every device you own that has Google Drive installed. Docs is Google’s word-processing application. If you have done any work with Microsoft Word, then you’ll be at home with Google Docs. Create text documents; format your text; add links, images, videos, tables, and more; and save in numerous formats including Microsoft Word, OpenDocument, Rich Text Format (RTF), or Portable Document Format (PDF). Documents created with Google Docs are automatically saved to Google Drive and accessible from any device that can access the Internet. You can even invite others to collaborate on your Docs files without having to email files and worry about duplication of efforts or lost work. Sheets is Google’s spreadsheet application. Sheets is a lot like Microsoft Excel and iWork’s Numbers. With Sheets, you can build lists, keep track of personal finances, analyze data, and so much more. Build formulas for performing complex calculations and data analysis. Filter, sort, and otherwise organize your data with ease. Just like Docs, all spreadsheets are saved in Google Drive and easily shared with collaborators. Starting a new business? You should consider using Sheets for your cash-flow projections. You and your business partners can work on it without fear of losing information or overwriting each other’s work! Slides is another of Google’s web-based OfficeSuite products. With it, you can create beautiful slide presentations with all sorts of pre-built or custom themes. Import images, videos, and other interactive content; link to web content like YouTube videos; and more. Whether you’re a student, stay-at-home mom or dad, or in the workforce, note-taking is an important part of life. Google Keep is designed to make note-taking a breeze. Use Keep to take written notes or voice notes. Easily add pictures and videos. Save your notes to Google Drive to share with other users and collaborators. 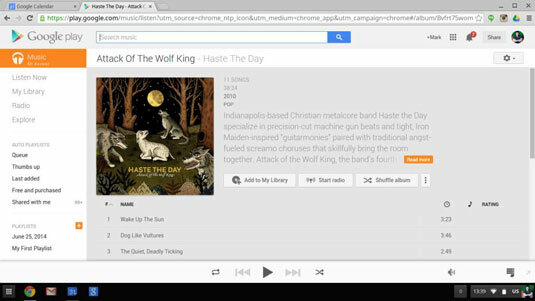 Google Play Music is the one-stop music utility on your Chromebook! Move your music collection into Google Play and have it be accessible to you anywhere in the world. Organize your songs into playlists, share your playlists, or listen to your friends’ playlists. Shop through the Google Play database of songs to purchase and expand your collection. You don’t need any fancy hardware or additional software to make calls using your Chromebook! Simply launch Google Hangouts, and you can quickly call any phone number in the world. Domestic calls are usually free, and international calls cost a fee; but you don’t need a phone to call your family anywhere in the world! You can even video chat with one, two, three, or more people all at the same time. Chat via text, and take pictures and send them. You can even share your screen or control someone else’s desktop from your computer all with Google Hangouts! Gmail is Google’s powerful and ever-growing free email platform. With Gmail, you can send and receive emails; attach files, pictures, and links; and quickly save attachments to your Google Drive cloud storage. Gmail for Chromebook also has an offline feature so that you can check emails, write emails, and queue them up to send the next time you get online. Google also offers Gmail for businesses so that you can have hosted email that comes from your domain. 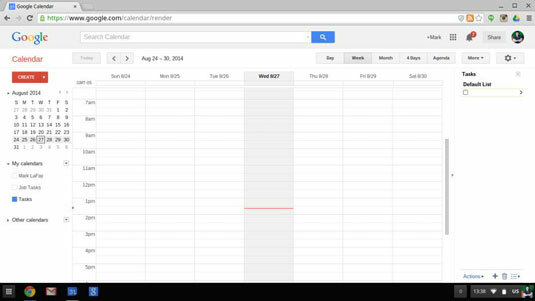 Google Calendar is a very powerful calendar system. You can easily create events on your calendar, set them to repeat periodically, set alarms, invite others to attend your events, and more. You can create multiple calendars within your Google Calendar and share the calendar with your family, friends, and co-workers. Organize your calendar and view it by day, week, month, or even agenda. Remote Desktop is a powerful tool for accessing your other computers. Install Remote Desktop on your Mac or Windows PC, and you can access them from your Chromebook anywhere in the world. Of course, the computers you want to access must be turned on and connected to the Internet. Other than that, accessing your files, running applications, and otherwise working remotely is a breeze with Remote Desktop. If you’ve used a Kindle or iBooks, you can probably imagine how easy and awesome Google Play Books is. Shop for books at low costs and store them in your Google Play Books account. 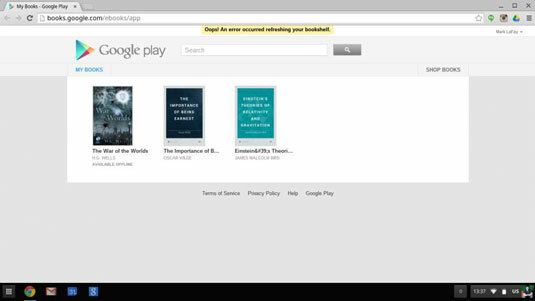 Easily sync your books to any device you own that has Google Play Books installed. 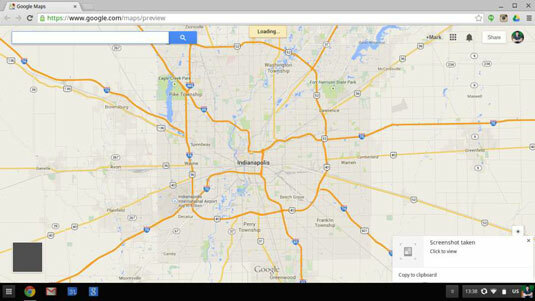 Google Maps is one of the most powerful map programs currently available! Look up point-to-point directions or route a road trip with multiple destinations. Wherever the wind will take you, Google will make sure you’re on the right road! Search for businesses, locations, or popular destinations within Google Maps; share maps with friends; and even zoom all the way down to the street view. Switch your views to satellite view and see if you can see the cars parked in your driveway!